In a large pot, heat the olive oil over medium heat and saute the onions, garlic, 1 tablespoon grated ginger, cardamom, and cinnamon. Stir to combine and saute for 6 minutes. Add the carrots and sweet potatoes. Saute for another 2 minutes. Add enough water to cover all of the vegetables. Bring the mixture to a simmer and cook until the carrots and sweet potatoes are soft, about 45 minutes. 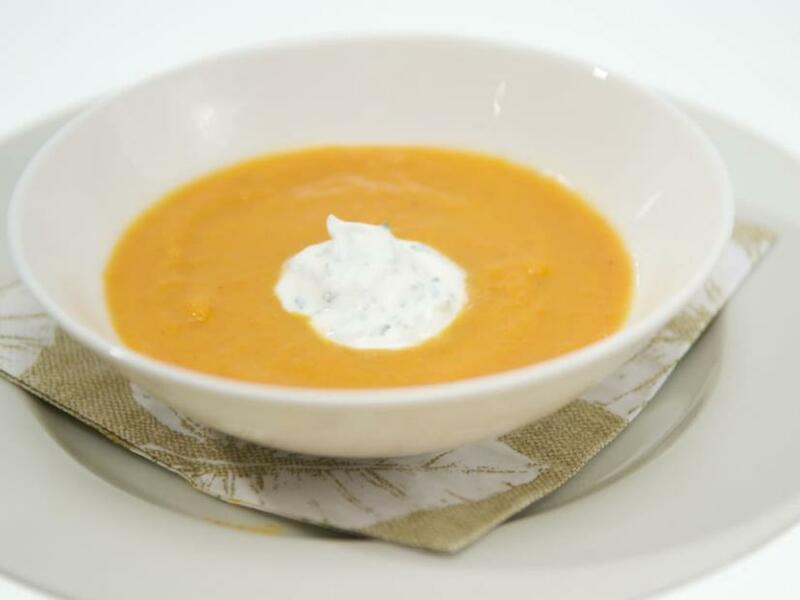 Remove the soup from the heat and using a hand held immersion blender, or using a food processor, carefully puree the soup until smooth, and then strain through a sieve into a fresh pot. Place the pot over medium-low heat and stir in the orange juice, apple cider vinegar, and remaining grated ginger. Simmer the mixture for 15 minutes. In a small bowl, stir the creme fraiche and cilantro together. To serve: Ladle the soup into bowls and top each bowl with a spoonful of the creme fraiche-cilantro mixture.